Volvo’s V60 and V60 Cross Country are among the few car-based station wagons currently offered. Times change. The station wagon was once seen as a quintessentially American vehicle, the official pace car of suburban baby-boom families from sea to shining sea. Nowadays, there aren’t so many true wagons for sale in the USA, and—as it turns out—almost all of the ones that are left come from European manufacturers. 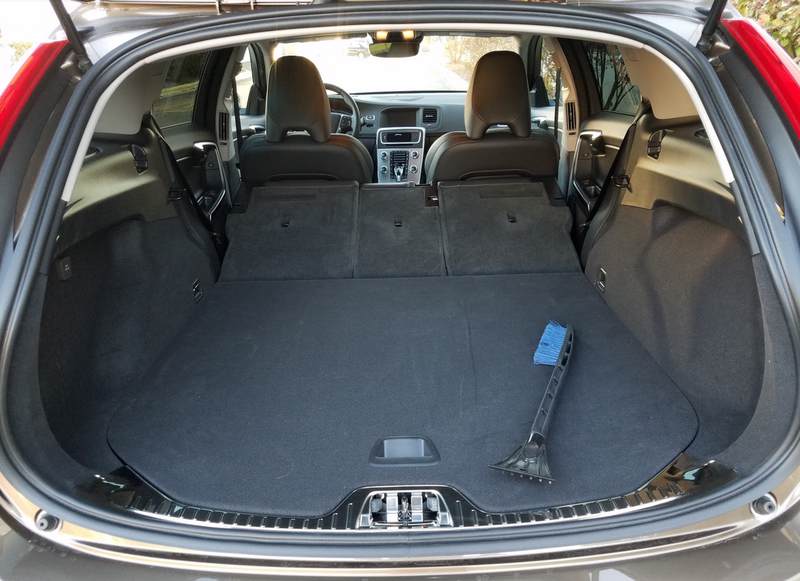 Perhaps the most dedicated advocate of the body style right now is Volvo, which makes wagons in two sizes and several choices of trim and mechanicals, including a sports model, no less. Among the variations is the Cross Country, offered in the V90 and V60 lines as something potentially a little more off-road (or bad-road) capable than a basic wagon but not quite even to the level of a crossover SUV. 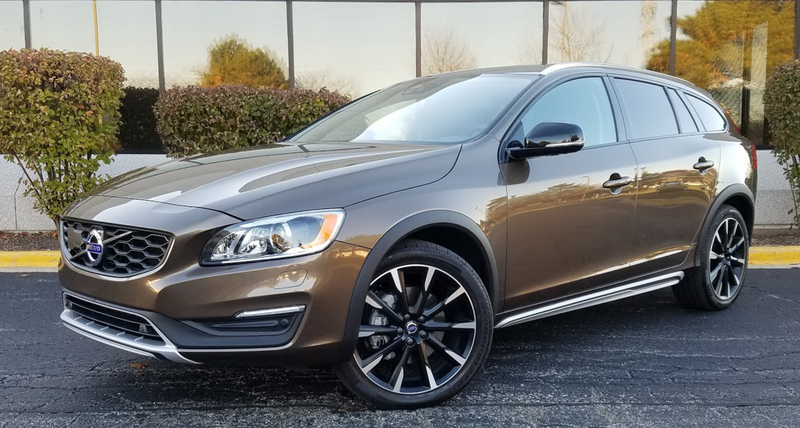 The smaller and cheaper Cross Country is the V60, one of which Consumer Guide® editors had a chance to test. 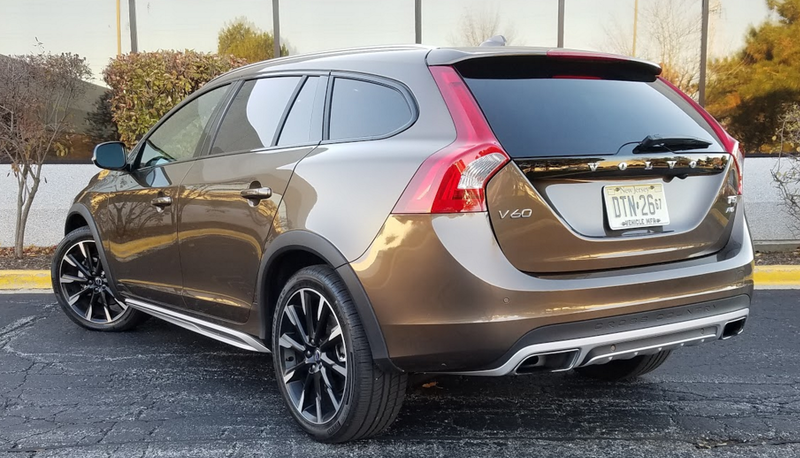 The V60 Cross Country, which has been around since the middle of the 2015 model year, gets a change under the hood as its chief alteration for ’17. For the most part, the Cross Country looks like other V60 wagons inside and out. However, where the “base” model comes in a choice of front- or all-wheel drive, the Cross Country features AWD, hill-descent control, ride height raised by 2.5 inches, front and rear chassis skid plates, and modest fender flares and rocker-panel cladding. At 3920 pounds, the Cross Country is 72 pounds heavier than a V60 with AWD (which has slightly better fuel-economy ratings). 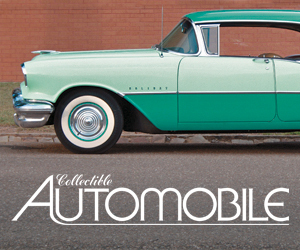 At $41,700 to start, the Cross Country is $3550 more expensive. Interior appointments impress, but the multi-button infotainment controls can be a bit tedious to use. Other standard features include 3D navigation, WiFi hotspot with built-in apps (such as Yelp and Pandora), 7-inch in-dash color monitor, 8-way power driver’s seat with memory, 40/20/40 split-folding rear seat, leather upholstery, power moonroof, dual-zone electronic climate control, power folding rear-seat headrests, cargo-area cover, and more. 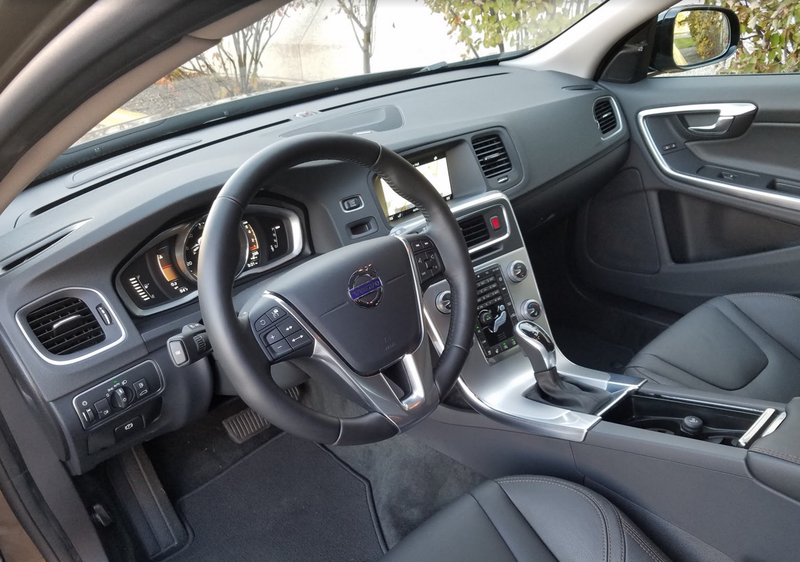 Major safety features include Volvo’s “City Safety” low-speed collision-avoidance system, rear obstacle detection, and Volvo On Call that provides roadside assistance plus remote starting and door unlock through your cell phone. To get a V60 Cross Country that’s got even more of the modern amenities requires stepping up to the Platinum “option model.” CG’s test car had this $3650 group that packs on an uprated Harman Kardon sound system, active headlights with washers and high-beam control, accent lighting, auto-dimming rearview mirrors, keyless starting, rearview camera, adaptive cruise control, forward-collision warning and mitigation, and lane-departure warning and lane-keeping assist. The test car was further enhanced with the “Climate Package with Child Booster Seats” (including heated front seats, steering wheel, and windshield), a “Blind Spot Information System Package,” premium Twilight Bronze Metallic paint, and 19-inch matte-black alloy wheels for a delivered price of $50,130. Regardless of how much a buyer might spend on V60 Cross Country it will deliver a commendable amount of ride comfort (with a little bit of a jolt on serious road imperfections), responsive handling (despite “disembodied” steering), and sure braking. The nicely appointed interior has good front-seat room but cramped legroom and reduced headroom in back. Drivers will find outward vision good in just about any direction. The boost in ride height doesn’t impose any serious penalty on passenger entry and exit. The infotainment system is beset by a lot of buttons on a centralized pad beneath the in-dash display screen. (This tester can’t shake the image of an old touch-tone telephone when he sees it.) Buttons for related tasks governed by this keypad tend to be grouped together by function, but there are complications. For instance, it takes a little more work than it should to find and save radio stations. Climate settings are also made on this pad with dials for temperature settings and a “seated-person” icon with sections that can be pushed to select where the fan blows: head, torso, and/or feet. Vehicle information shows up on a configurable display in the instrument cluster with steering-wheel thumb-button control. There’s a lot of cargo space in back, and the rear seat backs fold flush with the cargo floor (albeit at a bit of an upward angle). Good rear cargo capacity expands greatly when the rear seats are folded. They drop absolutely flush with the cargo-floor surface, which is raised to bumper height—a feature ordinarily associated with SUVs. The folding center section of the rear seat can serve as a pass-through for long, narrow items like skis. Meanwhile, cabin storage gets a mixed review. The glove box is decently sized but the console box with auxiliary and USB ports is small, as are pockets in the doors. There are two covered cup holders in the console, and two more in the rear pull-down center armrest. Rear passengers can avail themselves of pouches affixed to the backs of the front seats. You can’t say Volvo isn’t thorough with its coverage of the station wagon market, with practically every contingency covered for folks who want the added capability of all-wheel drive in some form. If there truly is a space between the V60 with AWD and the XC60 crossover SUV, then the V60 Cross Country fills that gap. 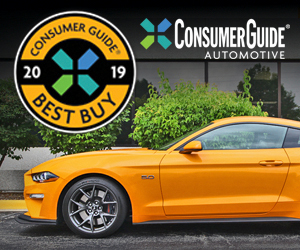 Written by: The Daily Drive staff on December 15, 2016.on March 22, 2019.